Our Mobile Homes transform the Del Garda Village campsite into a true holiday village for your break on Lake Garda. Comfortable, fully-equipped and immersed in the natural surroundings of the park, all our mobile homes are air-conditioned and have their own private garden. Orchidea and Rododendro await you: choose your kind of holiday. Treat yourself to the maximum level of comfort in this ultra-accessorised Mobile Home: your most exclusive camping holiday on Lake Garda is about to begin. Orchidea XL is housed in a dedicated area of the Del Garda Village campsite. It is the largest and most spacious of the Orchidea accommodation solutions, with three large bedrooms to accommodate up to 6 adults and 2 children. The particular colour scheme is the first detail that will strike you: the exteriors are colourful, and feature the same fine finishes of the interiors. A few examples include more space in the living room, two bathrooms, larger windows, better soundproofing in the rooms, and designer taps and fittings. Bright, functional, and air-conditioned, this mobile home comes with every comfort, thanks to the attentive design of its architectural elements and furnishings. Orchidea Smart represents the evolution of the Mobile Home family. Its two bedrooms and large living area overlooking the patio offer the ideal space to accommodate up to 4 adults and a child in a fully air-conditioned environment. The kitchen has everything you need, with a central island that serves both as a countertop and as a dining table. The exterior reflects the exclusive design of the Orchidea accommodation solutions, with bright colours, fine finishes and windows overlooking the greenery of Del Garda Village. 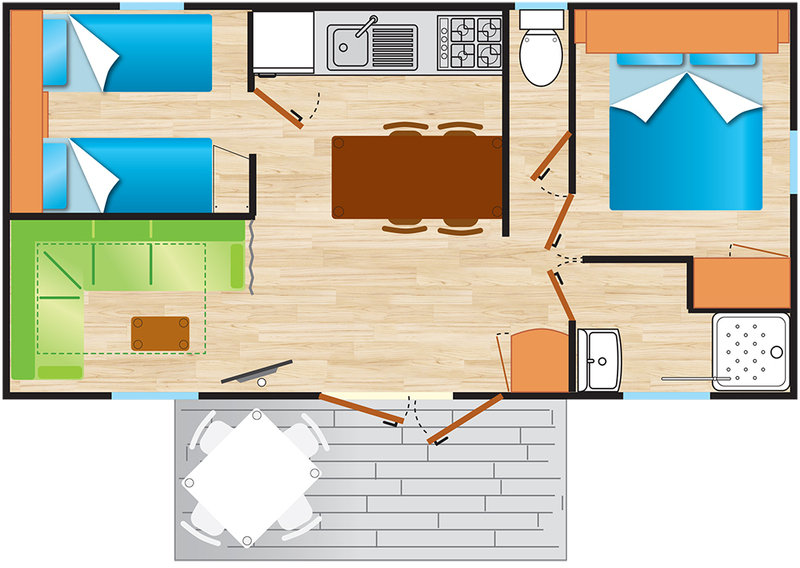 Experience the cubic comfort of Orchidea Suite, the open-plan Mobile Home designed to accommodate up to three people. From a distance Orchidea Suite looks like an elegant cube immersed in the green, but it has surprises inside. Beyond the sliding glass door there is an open-plan setting with living and sleeping area. There is everything a small family or a couple looking for privacy may need: equipped kitchen, double bed, bathroom with XXL-shower, sofa bed for child or plenty of room for the cot. You are surrounded by the warm colours of the floor and the wooden furniture, but you have nothing to worry about: you won’t feel the heat as Orchidea Suite is provided with air-conditioning. When you are bored of staying at home, you can go out on the covered terrace or in the big garden. Nature is not only outside but also inside: our Mobile Homes are built with biocompatible materials. Once their life cycle is over, they can be completely recycled. Let yourself be bowled over by this fully-fitted Mobile Home: your idea of camping will never be the same again. Rododendro symbolises comfort and nature: it is immersed in the natural surroundings of the Del Garda Village campsite and is made with hypo-allergenic materials, to ensure the wellbeing of the whole family. Its subdued colours highlight its elegant finishes: the skirting board around the furniture makes it easier to clean and the large windows allow a great deal of light to shine through. This new Mobile Home is spacious, air-conditioned and fully accessorised. Fully-fitted, organised and functional: the Dalia Mobile Home has everything you need to make your family holiday special. Dalia is the Mobile Home designed for your family holiday. The layout guarantees optimal comfort: living area with kitchen and lounge, double bedroom, triple bedroom, shower cubicle with sink and separate WC. The structure is insulated and the interior is fitted with everything you could possibly want for maximum wellbeing, such as an air conditioning unit, satellite TV and a smoke detection system.